Take in views of the waterway and the ocean from this 4 Bedrm 4 Bath Mid-Island Islander Villa that accommodates 12. Bedding configuration: K, Q, D/D, D/D. Hardwood floors in living area and bedrooms. This lovely villa offers all the comforts of home. Amenities include, pac n play, highchair, 5 televisions,2 DVD players and Wi-Fi. 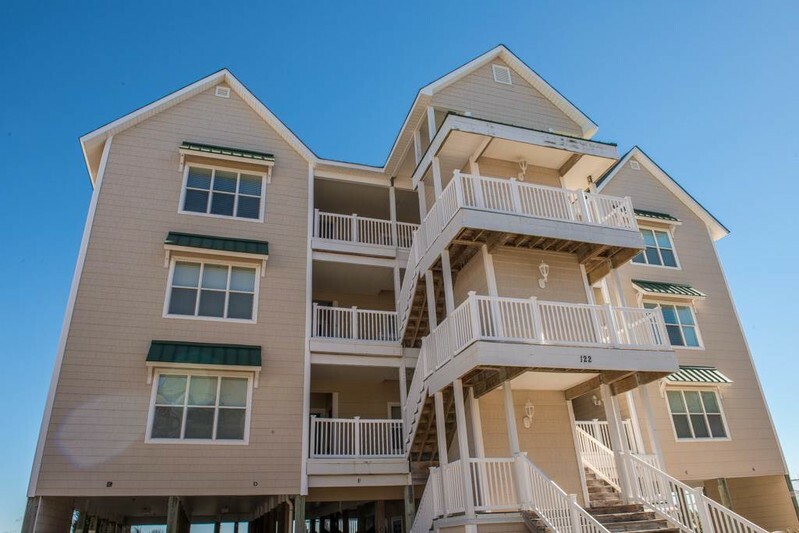 Within walking distance to the oceanfront beach club and oceanfront pool and tiki bar. The Islander Beach Club and Resort is located within the Islander Resort on the exclusive West End of Ocean Isle Beach. The villas are attractively decorated with 9-Foot ceilings throughout, whirlpool tub in master bathroom, and lots of extras, including top of the line appliances. Nothing compares to these beautiful villas! All Linens are included. Non-smoking, no pets. Our family of 5 had a wonderful stay in this beautiful home. The rooms are spacious, very comfortable and well kept. The location is close to the beach which makes for a very short walk and it is a quiet location which makes sitting on the back deck very peaceful as you look around. It has all you need to stay in and cook or you can drive down to the restaurant club. We can't wait to come back again!